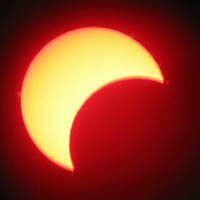 Updated Trends: A partial Solar Eclipse will be witnessed by most of the northern countries around the world on January 4th 2011. The Solar Eclipse is the first to occur in the year 2011, and this event can be seen in most of the countries around the world, with Russia and many parts of Asia witnessing it clearly. A solar eclipse is an event when the moon aligns between the Sun and the Earth and casts a shadow on the surface of the Earth. But the event which will take place on the 4th January, is a partial Solar Eclipse, where the moon’s shadow will strike the north pole of earth, and also most of the northern countries. The partial eclipse will be seen during sunrise in Europe and most parts of Northeastern Asia. It can be seen ending during sunset in western Asia. Sweden is the country where the Greatest Eclipse will occur and the axis of the moon will pass at a mere 510kms above the earth’s surface.